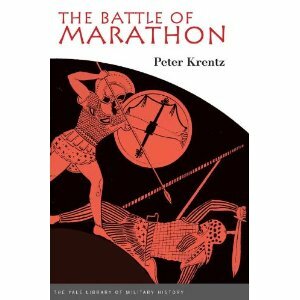 Stories of soldiers ancient and modern converge in Peter Krentz's new book, "The Battle of Marathon" (Yale University Press; $27.50), a new interpretation of a battle that changed Greek military history. In the Battle of Marathon, in 490 BCE, the city-state of Athens defeated invaders from Persia. For centuries, scholars have found fault with the earliest surviving account of the battle, written by the Greek historian Herodotus. Nearly all, for instance, have doubted Herodotus's claim that the Athenians ran nearly a mile when they charged the Persians. The soldiers' heavy equipment and armor would have made such a long run impossible, they argued. But Krentz, a Davidson College classics professor, wasn't so sure. He decided to test Herodotus's claim by consulting some modern wartime experts: American soldiers. In 2006, Krentz emailed dozens of Davidson College ROTC graduates asking about their experience running with heavy equipment. About 50 responded, and many described training that involved running for miles with a 35-pound rucksack and gun. Based on their accounts, Krentz says he became convinced that Herodotus's story was plausible. Among those Davidson graduates was David Taylor Jr., a 1991 graduate and Army major who took the time to email Krentz from Iraq with a long, thoughtful response. A few months later, Krentz learned Taylor had been killed -- the first Davidson graduate to die in the Iraq war. Krentz dedicates his new book to Maj. David Taylor. "It just felt right," Krentz says, as a way of remembering Taylor and all the ROTC graduates who helped him. It also felt right to dedicate the book to a soldier, since the Athenians' victory in the Battle of Marathon, Krentz believes, was a victory won by the soldiers, not the commanding officers.